Heatshield Products designed the Cold-Gold Shield for the person who loves chrome, polished aluminum and billet and the mesmerizing brilliance of metallic paint: the shine and allure. It deflects heat without adding dead weight, no matter how tight the space, all the while looking like a million bucks. Heatshield Product�s engineers have been developing our TruGold technology for years as we have become tired of people spending a lot of money on glorified stickers. . Birthday balloon �gold� thermal-barrier products on the market are use a yellow Mylar to shield radiant heat. While Mylar can reflect radiant, so can aluminum foil at a fraction of the cost. The Heatshield Products Cold-Gold Shield is made from exclusive TruGold thermal-barrier technology that won�t degrade after long-term heat exposure. 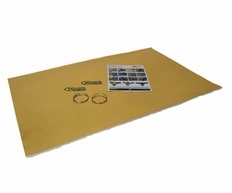 The real gold color combined with a full high-grade fiberglass cloth backing make this a real gold heat shield. It can take constant ambient temps of up to 1,100 degrees Fahrenheit, intermittent ambient temps of 2,000 degrees Fahrenheit and direct-contact heat of up to 500 degrees Fahrenheit. With an optimal air gap of 1 inch or more for maximum thermal reflection Cold-Gold Shield can reflect up to 90% of radiant heat. If you ever have a catastrophic fire, Cold-Gold Shield also acts as a full protection barrier because of its full coverage of high grade fiberglass cloth backing. The gold coating will burn away but the fiberglass is there to act as a fire barrier protecting your components.